Dragon NaturallySpeaking is amazing voice recognition software that lets you control the computer with your voice. 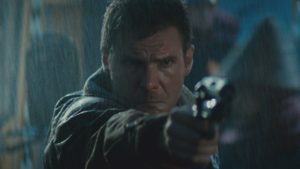 It almost sounds like science fiction, but the truth is that Dragon NaturallySpeaking totally surpassed our expectations. 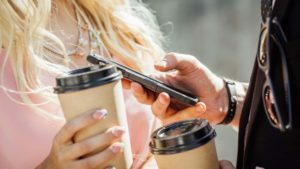 It seems that text-to-speech technology has improved a lot over the last few years, and Dragon NaturallySpeaking has clearly taken advantage of it. 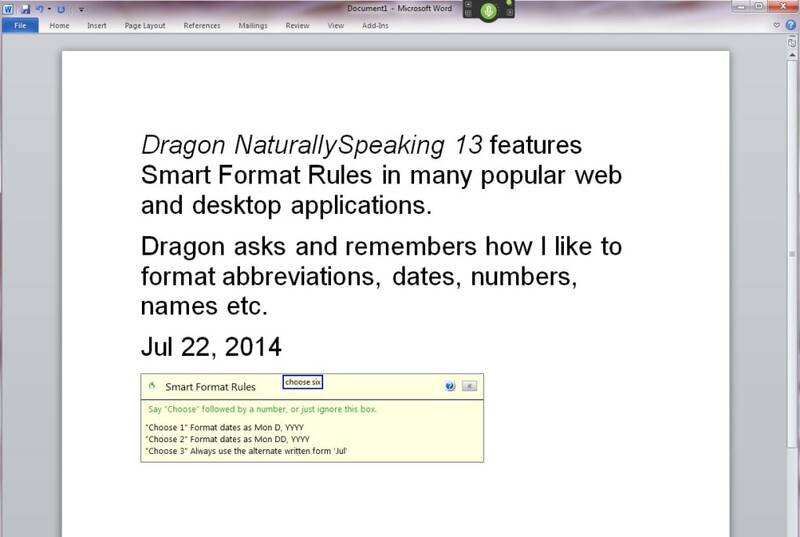 The main drawback to Dragon NaturallySpeaking, like with any other voice recognition program, is that it requires some long, boring training – based mainly on reading texts to the computer. Also, the program isn't 100% accurate – something that we expected anyway – but its percentage of right words in dictation still remains certainly impressive. 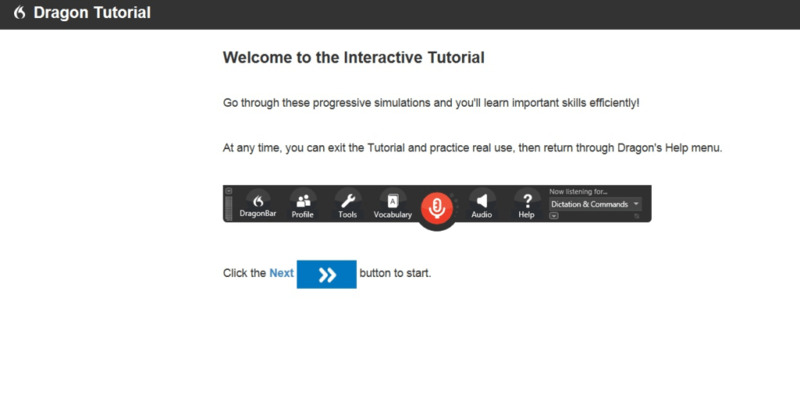 After training Dragon NaturallySpeaking, the program is quite intuitive and easy to use. 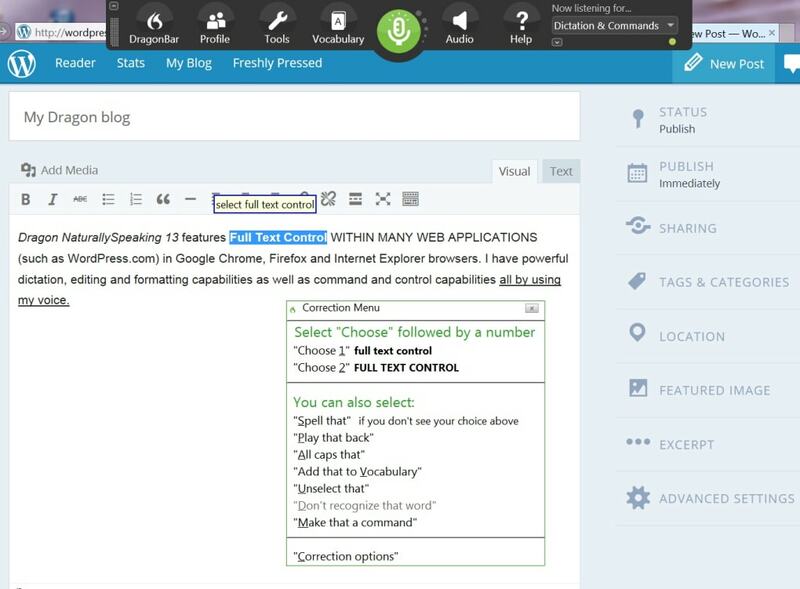 The interface is reduced to a small bar from which you can access all the main tools and functions: dictation, reading text aloud, improving accuracy, managing commands and vocabulary... and the best thing about Dragon NaturallySpeaking is that you don’t need to speak to the computer as if you were a robot. Just talk naturally, and it’ll pick it up. Dragon NaturallySpeaking is seamlessly embedded in Windows, which means that as long as you have it running, you can start dictating in any application, from Notepad to Firefox. 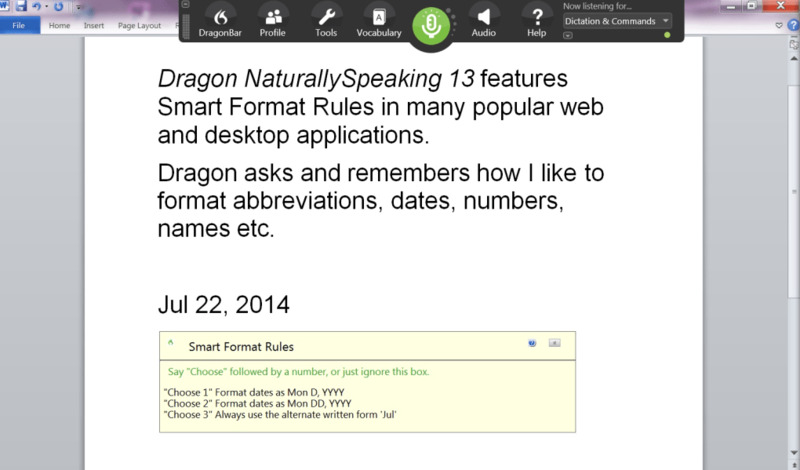 And of course, the functionality in Dragon NaturallySpeaking is not limited to dictation: you can also control the computer with your voice: open and close apps, browse the web, view files, and more. Dragon NaturallySpeaking is, in other words, like one of those amazing voice-controlled computers you see in movies, only that this time it’s on your own PC! 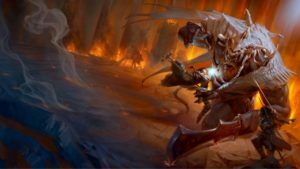 Dragon NaturallySpeaking is an amazing voice recognition tool that lets you control the computer with your voice and dictate texts in any application. Enables you to accomplish more on your computer in less time by talking instead of typing, so you can realise your potential at work, school or home. Dictate, edit and format letters, articles, papers, essays, spreadsheets, presentations, reports and more. Search the Web to find facts, figures and images for inclusion in assignments and documents. Take voice notes on the go by dictating into a digital voice recorder or smartphone for later transcription. Enter frequently used text or graphics into a document with a voice command. Email by dictating, editing and sending messages using your voice. Speak into a chat client instead of typing. Enter and check class schedules, client meetings, kids’ activities and other calendar appointments by voice. Update your status and check what’s new on social media like Facebook and Twitter. Multitask by interacting with your computer hands-free to fit more in your busy day. Delivers up to 99% speech recognition accuracy right out of the box. Talk naturally at normal speeds and your words appear on screen almost instantly, enabling you to dictate documents up to three times faster than you can type. Dragon learns words and phrases you use the most, spelling even difficult words and proper names correctly. Launch applications, select menu items, execute key functions, switch windows, search the Web, create and send emails and more — all by voice. You have the option to use the included microphone, iOS or Android smartphone as a wireless microphone, laptop built-in microphones or a wireless Bluetooth mic. What do you think about Dragon NaturallySpeaking? Do you recommend it? Why?